In response to challenges that the disparate impact doctrine violates the Fourteenth Amendment’s Equal Protection Clause, the Thirteenth Amendment provides a constitutional foundation that deflects the equal protection argument. Early interpreters of the Thirteenth Amendment envisioned the provision as a means to abolish chattel as well as civil slavery, which was the condition of subordinate status shared by all Black persons. Resurrecting this interpretation of the Thirteenth Amendment reveals that early efforts to transform the status of Black persons failed as they unduly focused upon freedom of contract, rather than measures to achieve effective, individual agency. 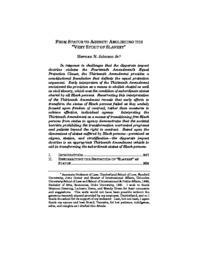 Interpreting the Thirteenth Amendment as a means of transitioning free Black persons from status to agency demonstrates that the societal barriers prohibiting the transformation warranted programs and policies beyond the right to contract. Based upon the dimensions of status suffered by Black persons—perceived as stigma, station, and stratification—the disparate impact doctrine is an appropriate Thirteenth Amendment vehicle to aid in transforming the subordinate status of Black persons.